Another great piece in the CSO Insights Buyer Preference Survey shows that buyers want to be engaged by salespeople but 70% of buyers find "other resources more relevant and more valuable than talking to salespeople". The graphic below shows the situations that buyers want to be engaged however the salesperson needs to be relevant, valuable and differentiating. When the salesperson is not in the room they need content to do this. For this to be achieved it is important that you make your sales people part of the content production process since they know what challenges the buyer is facing. If achieved, this will help to engage the buyer earlier on in their buying process and increase sales. More than 70% of buyers usually engage with salespeople later along their customer’s journey, after their needs are already clarified. Why? Because buyers find other resources more relevant and more valuable than talking to salespeople. That means that buyers are spending less and less time with salespeople. So, the challenge for salespeople to be relevant, valuable and differentiating is increasing, but they have fewer opportunities to show these attributes. How can salespeople get more opportunities to be in touch with the modern buyer? The surprise is that it shouldn’t be difficult for salespeople to engage earlier with buyers, because 90% (!) 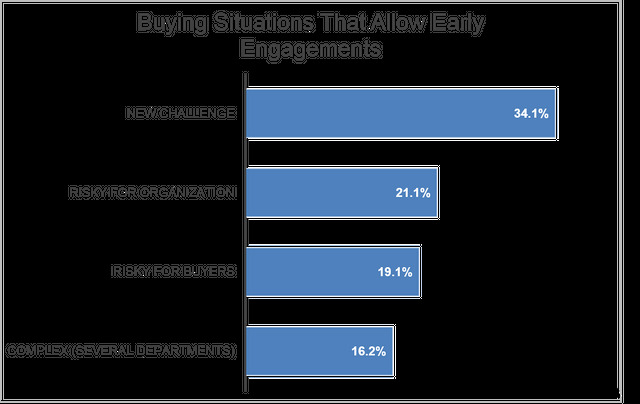 of buyers said that they would be open to engaging with salespeople earlier in their buying process. And buyers also named the specific situations when they would be open to an earlier engagement.
.@brit Morin realized she couldn’t be a one-person content factory if she wanted to scale🚀 and started to think of *crowdsourcing* as an integral part of her scale strategy.